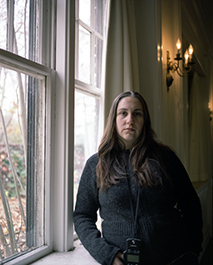 Lisa Kereszi hails from suburban Philadelphia, and studied writing and photography at Bard College, and photography at the Yale School of Art. Her work is in the collections of the Whitney, New Museum, Brooklyn Museum and others, and she shows at Yancey Richardson Gallery in New York. She has published several books: Governors Island (2003 Public Art Fund exhibition catalog), Fantasies (Damiani 2008), Fun and Games (Nazraeli 2009), Joe's Junk Yard (Damiani 2012), and The More I Learn About Women (J &L 2014 artist book. She lives and works in the New Haven area, where she teaches photography and is Director of Undergraduate Studies in Art.